"This is an Asian-style dipping sauce for coconut shrimp." Heat the olive oil in a large skillet over medium heat; cook and stir the garlic and red pepper flakes in the hot oil until fragrant, 2 to 3 minutes. 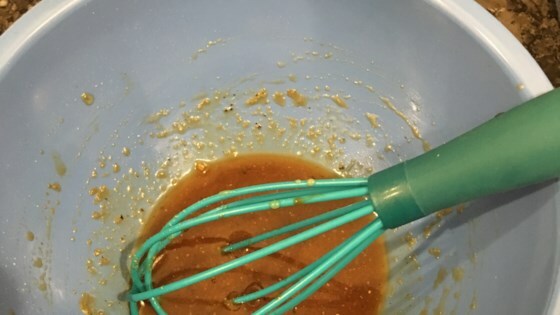 Add the ginger, soy sauce, honey, orange juice, sesame oil, lime juice, and sesame seeds; stir. Cook until heated, 2 to 3 minutes more. Great flavor, but, I wish it were not so thin. Very good with baked coconut shrimp. I didn't have any fresh ginger on hand, so I had to substitute ground ginger. To reduce the thinness, I stir in a little cornstarch or arrowroot starch before cooking. These are commonly used thickening agents in just about any Asian style sauce. Winner! Will use over and over again. Everyone one loved it!